STiNO eyevis and MMD, the technology company and brand license partner for Philips Monitors, jointly showcase Digital Signage solutions at Viscom in Frankfurt from November 5 - 7 at booth 3.1E55. It includes the iChannel 7 CMS cloud solution, AudioPlay InStore radio cloud service, ePromoter smart remote screen management solution for product promotions for the SME market segment, and touchPromoter multi touch and kiosk presentation software at the new Philips BDL4254ET as 42” multi touch display. iChannel 7 is STiNO’s cloud based content management system version 7.1 targeting vertical market segments providing an intuitive and easy to use web frontend with reports and proof-of-play functions for selling advertisements. Additionally it contains campaign management with playlist scheduling, device management, user role management just to name a few core software features and is offered as a SaaS or perpetual software license. 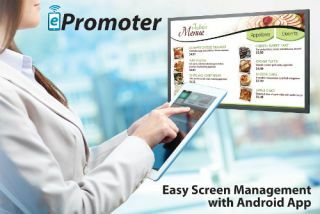 ePromoter is STiNO’s Android software solution that publishes content to large-format displays using an intuitive drag and drop interface from any Android smart phone, tablet, or smart display. This will allow the smaller shop or restaurant owners to use cost efficient digital marketing in their location without the need for network and server infrastructure. Additionally, STiNO offers a large selection of PowerPoint templates that can be easily edited by any user and saved as a slide show or video for use with the ePromoter manager. “We are excited to demonstrate our products with the display products of Philips Signage Solutions at our stand. This allows us to present high quality but highly cost efficient product bundles for various digital signage applications", says Franz Hintermayr, CEO of STiNO eyevis GmbH.